Scythes, water, and wildlife that excrete things are not normally compatible with expensive camera equipment but the Hero7 is in its element under these conditions. I stuck it on a pole and launched it under the blades of the swishing metal as the naturalists (not naturists - long cutting implements and naturists don’t mix!) hacked, chopped and slashed their way through the undergrowth. Up into the air it went as I swooped it majestically like a mini jib operator or drone pilot. I pushed it fearlessly through the undergrowth and dived it into ponds. The results were brilliant. Sure you can’t adjust the exposure, there are no fancy pull focuses or macro shots of animals in their elements but for the sheer joy of the unexpected angle it was a pleasure to use. Anyone who has read any of my previous KitPlus articles will know that The Boy Bearder is all about equipment that is small, portable and compact. Bijou is beautiful in the world of the documentary filmmaker. With this in mind it will come as no surprise to hear that I’ve always had at least one GoPro in my kitbag. The ability to stick them anywhere and to the parts other cameras simply can’t reach has made them indispensable. Combine this with their robust - almost indestructible build and you’ve got a tool you can use in areas that you’d never risk a conventional camera. Hero 4 is so old I’ve long considered upgrading for a while now. Even the peculiarity of the angle wasn’t making up for the obvious ‘GoPro’ picture quality. It was time to take the plunge so when they launched the Hero7 I was first in line. I’m sure those with later models will already be aware that the picture quality is a significant step up from the 4. I’m always blown away when a camera of this size can shoot 4k in such rich and exciting colours - this does, and it does it well. It’s not too punchy or over saturated and holds up well to grading. What I also love is small changes like the fact the whole unit is waterproof straight out of the box. You can voice activate the controls, the microphone is really excellent, and the cage gives you access without having to dismantle your entire mounting unit to get to the battery. It’s the small details that make all the difference. I realise by saying all this is a bit like your grandfather coming in and telling you that colour television is amazing. If you’ve already got a GoPro6 you know all this already, so what’s new and why did I finally decide to upgrade this time? In a word, stabilisation. I love unobtrusive, easy to use systems that just let you get smooth shots without inserting something between to operator and the camera. I didn’t upgrade my GH5 for to the S version for that very reason - the lack of in body stabilisation is just too big an issue for me. I love quality stabilisation and this, good people, NAILS IT. As a cameraman the fact that it can Broadcast live is frankly a secondary consideration but it will mean that it will sell well to bloggers and corporate PR chaps that want to stream meetings onto their Facebook pages. I tried it connected to my office Wi-Fi and tethered to my phone on a train to London and it was really neat. Especially as the microphone is so good. But there is a frankly surprising Achilles heel. Currently you can only stream to your personal Facebook Account which is a fat lot of good to the head of marketing at United Widgets Ltd trying to broadcast his CEO from the company Facebook Page. There are complicated work arounds involving connecting via RTMP putting it on YouTube - but frankly life is too short. I expect the uproar from the consumer end of the market will be loud enough for GoPro to update the software relatively quickly. The important thing is that the camera hardware is a winner and if you are looking to upgrade or pack a GoPro for the first time this is the point to get on board. If you are going to buy one I’ve consistently said go local. I got mine from the excellent team at Broadcast & Production Services (www.bps-tv.co.uk). 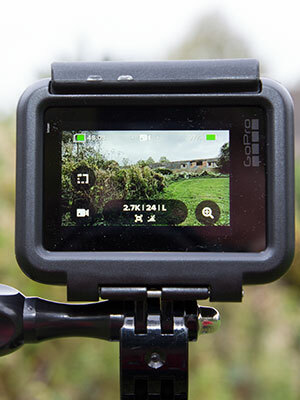 The price from them is just as good as you’ll get from GoPro direct but you have all the peace of mind and confidence that you are buying from a UK-based stockist with exceptional customer services and a delivery network to match.